They were an unlikely pair. One is a rich businessman from Hong Kong, the other is an Olympian diver from Mainland China. One spoke broken Mandarin, the other didn’t understand Cantonese at all. Just how did Kenneth Fok (霍启刚) and Guo Jingjing (郭晶晶) come together? 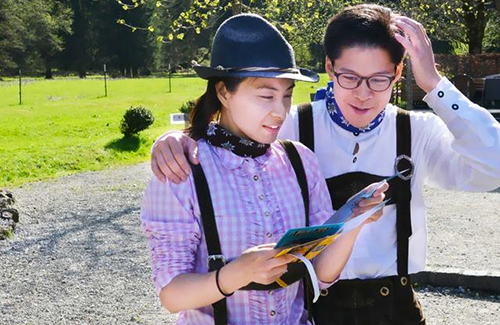 In the latest episode of The Amazing Race: China Rush <极速前进>, Kenneth and Jingjing talked about their romantic first meeting. It started with the 2004 Summer Olympics in Athens, Greece, where Kenneth went to witness live. Kenneth didn’t know who Jingjing was at the time until he returned to Hong Kong and saw replays of Jingjing diving. Kenneth said he was captivated by Jingjing’s talent and skill. When the Olympics were over, Jingjing and her team went to Hong Kong for a press conference and a celebrity banquet. Kenneth was also there, and introduced himself to Jingjing as a fan. He then requested a photo with her. The Hong Kong businessman expressed that, because they were in a long distance relationship at the time, they would always communicate with each other over text. The couple communicated in English at first; having grown up in England, Kenneth was never very skilled at typing in Chinese. Kenneth and Jingjing married in November 2012 welcomed their first baby, a boy, in 2013. Jingjing said marriage has taught her how to prioritize relationships. Kenneth also likes Jingjing’s simplicity and realism. Despite the couple being a hot subject for gossip magazines, Kenneth and Jingjing have managed to maintain private lives over the years. They prioritize their son over anything else. Oh I love this! He seem like a great guy and def was infatuated with her! He made great effort to woo her and it seem so simple but sweet! Love this! Yeah, prob an old fashioned and simple guy at heart. I mean how many rich young ( relatively younger compares to all those old ugly rich middle aged dude ) guys that have been overseas for their studies and still picked a girl in the mainland? Actually, a very interesting pair. @kiki actually I’m not surprised. As i have watched her dive on tv before and i find her amazing! Not the prettiest girl but find her just awesome. Power in a small package! why couldn’t you have added, “not the most handsome guy, but very nice.” are women’s value only in being pretty? @msxie0714 with so many rich guys going for young hot girls that I do find it neat that he went for her. And no I don’t believe woman value in only being pretty. That is why I enjoy reading this. I don’t find her to be that young hot girl but she is a talented and amazing so I can see why he fell for sure. I guess i do lump all rich guys as being leeches and uses their money for them young pretty girls. @nigel wow had no idea. Errr, that romantic courtship sounds simpler than what I recall it was, back then. GJJ was in another relationship with another national China diver at that time. Even after divorce, she was snapped up by another high profile society dude and seems happier than she was with Timothy Fok (Kenneth’s dad).